Have you recently experienced drastic weight loss? Congratulations on your hard work! However, the downside of shedding the pounds can sometimes be the extra loose skin, especially in your arms. You’ve worked too hard to give up now. You deserve to have the rest of your body be firm and fit. Targeting the flabby skin may be easier than you think. 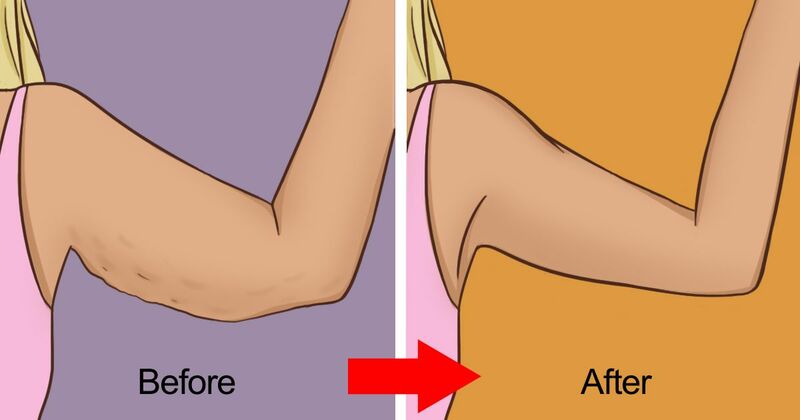 Let’s take a look at some natural remedies for firming up loose skin on your arms. These solutions are so simple that they are definitely worth a shot! Read on to learn more. Healthy and Natural World indicates that regularly using sea salt scrubs could prove beneficial for sagging skin. The scrub works to promote increased blood flow and better circulation. In turn, your skin will feel firmer. Proper hydration is key for overall good health and especially so for your skin health. Livestrong warns against drinking caffeine drinks that can zap your metabolism and energy levels. Keeping hydrated with water will reduce the development of wrinkles and promote toning. Allwomenstalk reminds us that too much sun means bad news for you skin. If you are already battling sagging skin, don’t make it worse by overexposure. Too much sun will break down your skin and lead to more wrinkles and sag. Be sure to cover your skin and wear sunscreen whenever you are outside. The hydro lipids found in egg whites help boost sagging skin. Top 10 Home Remedies indicates that the astringent properties also promote firming. To use, simply separate and whisk the egg whites and apply to the skin like a mask. Allow it to set for 20 minutes before rinsing. A bit of honey on your face could do the trick for firming your skin according to Top 10 Home Remedies. The antioxidants found in this sweet ingredient works to repair damaged skin and promote hydration. Not only is it good for flabby skin, but can also decrease the appearance of fine wrinkles. Who doesn’t love a relaxing massage? Not only is it good for your mental health, but according to allwomenstalk, it can work to tighten and firm skin because it increases circulation. Green tea can help boost your metabolism and energy levels. According to Eat This, green tea contains catechins which helps release fat from cells and transform that fat into usable energy for the body. Drink three cups per day to look and feel great! Be careful of losing weight too quickly. It is hard on your body to go from one extreme to the next. Plus, you need to allow your muscles the opportunity to grow as you lose the pounds. This will help reduce the appearance of sagging skin. Coconut oil is a natural way to hydrate your skin. Saggy skin benefits form proper hydration because it works to tighten and firm. Apply a bit directly to the loose skin several times per week. Lemon is a great source of Vitamin C. This is great news for your skin! It helps to produce collagen in your skin and promote elasticity. Plus, according to Top 10 Home Remedies, the astringent properties help naturally tighten skin and prevent premature aging. To use, simply juice a single lemon and apply the liquid directly to your skin. Allow it to set for 10 minutes before rinsing clean. Ready to get your arms whipped into shape? Try out these remedies and tell us what you think! Share with your friends so they can try them, too.